An anxious dog can be difficult to live with but there are things you can do to help calm him/her down. Before you try them though remember you’ll need to be patient, and that punishment never works to alleviate anxiety. In fact, it only makes it worse. Work patiently and kindly and you’ll be amazed how quickly an anxious dog can become a chilled canine. Write a trigger list of all the things that make your dog fearful, whether they be thunderstorms or car rides or visits to the vet. Now list what you can do to make things easier. 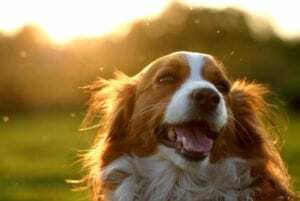 If your dog is freaked out by thunderstorms (many are) distracting him from the noise by providing alternative, more pleasing sounds like music can help calm him. If thunderstorms terrify him try to stay with him when they occur. You are his best friend and protector; he feels safest with you. A cuddle, soothing music and other distractions like tasty chews and toys can all help. Many dogs experience anxiety when visiting a veterinary clinic. However, if your dog associates the clinic with a fun place where people give him treats and talk nicely to him, he’ll soon calm down. Put him in the car and take him to the vet – just to say hi! Let the reception staff know what you’re planning so they welcome him with plenty of love and special attention. You could even ask that he be weighed or walked through the consulting room just to get him used to the place. This should take just a few minutes, and then you leave without any prodding or poking from the doctor. This should ease his next (real) visit. Dog training classes conducted by professional pet behaviourists will often instill confidence in a dog and they’ll teach you to better understand his body language and what he is trying to tell you. 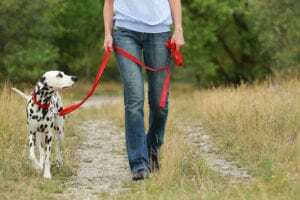 It is obviously always best to train a dog from puppyhood but even if you’re dealing with an adult, there is a lot you can (both) learn from training classes. If you only ever take your dog in the car when he’s being taken to the vet, it’s understandable that he’s anxious about cars. 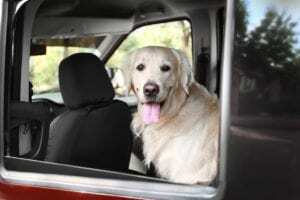 Drive him to the dog park, to a friend or to the Vetshop where you buy his treats. Making positive associations with the car will go a long way to easing his fear of travelling. Everyone needs their own special space where they feel secure. Whether it’s a crate or a bed in a tucked away corner of a quiet room, you’ll be lessening your dog’s fears if you give him his own space. It may even help to put a blanket over the crate so it is warm and cosy. Ensure your dog’s haven is away from high traffic areas and loud noise. An anxious dog is a dog that needs to be understood. He/she needs love, affection and an owner willing to put in the hours to make him less so. Ask your vet for advice. There are also medications that can be prescribed if the anxiety isn’t easing. We’re your partners in this journey; we’d love to help.